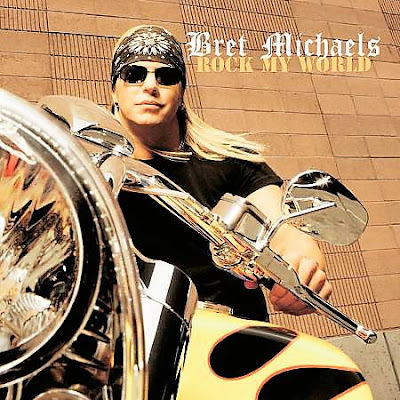 After two stints starring in Rock Of Love and a run as a celebrity judge on Nashville Star, Poison frontman Bret Michaels has released his third solo album, Rock My World. The disc features two new songs with remixed and remastered material from his previous solo albums. Rock My World launches with the playful first single "Go That Far" which also served as the theme song to Michaels' Rock Of Love. Highly appropriate to start the disc as it is familiar to fans that are new to Michaels' solo music. The other new track is "Fallen" which is honestly the best track on the disc. Lyrically potent, the song may be looked at as "Every Rose Has Its Thorn" retread but I would have to differ there. "Driven" (which first appeared on Michaels' 2005 collection Freedom Of Sound Vol. 1) is a welcomed inclusion here as it is as high on energy as it is sexual innuendo. If anything, the most musically diverse tracks were taken for this set and sprinkled throughout the disc. The Blink 182-ish "Bittersweet" feels a little odd in the set when surrounded by powerful songs like "Raine" and "Start Again." "All I Ever Needed" is outstanding and Jessica Andrews vocal assistance adds a needed hint of femininity. "Menace To Society" is lyrically abysmal but the energy is infectious. "Right Now, Right Here" has some haunting moments nestled in the chords. "It's My Party [2008 Mix]" is just an out and out party song. There is a reason that we avoid reviewing previously-released material. If you've heard it, there is less of a reason for us to tell you about it because you already have an opinion. This collection straddled the fence of our review policies as it contained new songs, new mixes and mastering. That said. This is a good overview of his recording styles. Some may find those 'styles' may be too much, too diverse or too manic for their tastes. That may be good, though, as the project director knew enough not to overload the set with ballads when titled Rock My World. We recommend this album for those newly interested in Michaels' solo career and believe several of these songs deserve inclusion on all of your iPods.